DEBORAH CROMBIE: Did you know that talking to strangers could make you gain weight? I'm not kidding. It happened like this. This last Thursday night I was in Wilmington, Delaware, having dinner with Caroline Todd and a friend of Caroline's (thanks, Betsy!) after a great signing at Chester County Book Company in Chester County, Pennsylvania. And now we get to the fattening part. I'm not usually much for deserts, but I'd seen on the menu that they had coconut pie. Shelby assured us that it was really special because they used fresh coconut. I had a wave of nostalgia--my mother made fabulous coconut cream pie, and I suppose that memory was what tipped me over into temptation. Shelby brought one serving of pie with three spoons, and, oh, my, this pie was nothing like my mother's. This was a custard pie, not a cream pie, and topped not with meringue but with what tasted like whipped creme fraiche. Rum sauce. No crust. We all tasted it, but even between the three of us we couldn't finish it, it was so rich. It was also one of the most delicious things I've ever tasted. This is a copycat recipe, so I can't guarantee that it will taste just like Bonefish Grill's Coconut Custard Pie, but I'm willing to give it a try. I just have to think of a special occasion to justify it, and learn how to grate fresh coconut, because I have no doubt that Shelby was right and that is what makes it so, so special. Pie Filling: Place milk, cream, sugar, flour, eggs and vanilla in a mixing bowl. Mix with a hand mixer for 2 minutes on medium speed. Add coconut and mix together until completely incorporated. Place in a greased pie pan. Cook at 350° for 40-45 minutes. Rum Sauce: In small sauce pan, heat butter over medium heat until melted. Add brown sugar and mix together until sugar dissolves. Add rum and cook for 1 minute on medium heat. Slice pie and serve with rum sauce, to your liking. Pie best when served warm. 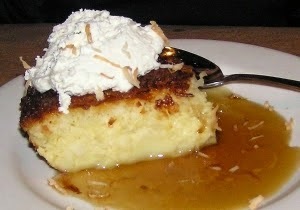 Bonefish Grill has an amazing menu, but I've never tried their coconut pie. Thanks for the recipe . . . it sounds delicious. Funny, I was just thinking about coconut pie. When I was in my late twenties, I used to spend the week between Christmas and New Years at a resort in the hills above Montego Bay, Jamaica. The proprietress, Miss G, made a coconut custard pie to die for, with fresh coconut. Periodically, I see coconut pie in a store or a restaurant, and purchase it, in the high hope of finding that flavor again, but have not been successful. If I find a Bonefish Grill, I will have to stop in and see if theirs is like hers. Thanks for the tip. Coconut pie is my favorite, and this sounds wonderful. Bet you could substitute coconut flour in the recipe for a gluten-free alternative, since it's just there for thickening. Also, there's a Bonefish Grill across the street from Joseph Beth here in Cincinnati. Next time you're here, I'd love to treat you to dessert. Debs, son-in-law #2 is from Georgia, and his favorite food is field peas. He was HORRIFIED at the idea of anyone eating them dried. Four years later, that still cracks me up. And having bought some at the farmers market on his recommendation, I totally agree about how good they are. Somewhere along the way I changed from being a gal who could pass up dessert with no problem. Now? Pfft - I'd rather have a nice dessert than just about anything - which is why I'm now on a serious diet. That pie looks soooo decadent I could slurp it right up! There's something about traveling that makes me think it's okay to eat the things I wouldn't normally eat at home. What's with that?? I agree, Debs, that strangers can be the source of great temptation in the food department. The coconut pie in the picture looks completely decadent and delicious. On my recent trip to Key West, my travel buddy and I ended up eating one night at an unplanned restaurant, Firefly Southern Kitchen on Petronia St. After dinner, the waitress enthusiastically revealed that the chef made a Key Lime cake, not pie, to die for. It was a recipe from his grandmother and he wouldn't tell anybody what it was. Well, I had to try it. The waitress hadn't exaggerated one bit. Every bite was a taste of heaven. Lucy, if you haven't tried this cake at this restaurant, please go have some for me. Deborah, thanks for the recipe. I've never tried that Bonefish Grill but will have to make a trip out that way! I've lived in Delaware for years and never knew there was a lima bean thing. I LOVE lima beans and spent many hours shelling them fresh out the garden. Yep, I'm a Southerner. I LOVE coconut cream pie. This sounds like an interesting twist on the tradition, one I'd love. But the calories it's got to pack are astounding.